Normally I would review each book in the trilogy separately. But that’s somewhat of a long and laborious process especially when a lot of the strengths of these books are shared between each other and I don’t want to rehash the same points further one. So I’m going to review this trilogy together. When last we were with these characters, Erevis Cale, Drasek Riven and Magadon, they had just stopped a very powerful mage from unleashing some really dark sorcery on all of Faerun. But they had each suffered in their own way. Erevis Cale had lost much of his physical humanity and was now a creature of shadows. He had also become an agent of his god, Mask the Shadowlord. The same goes for Riven, who once used to be Erevis’ opponent and rival but is now a friend. Of course, he is another agent of Mask by now, and both he and Erevis are two halves of a greater whole, serving Mask as the Shadowlord needs or requires them to be. Seeing that friendship come about in The Erevis Cale Trilogy was most definitely a highlight of the omnibus. With Magadon, half-demon and half-human, that friendship extended even further, and together all three became a really solid and dependable unit of adventurers out to save the world. 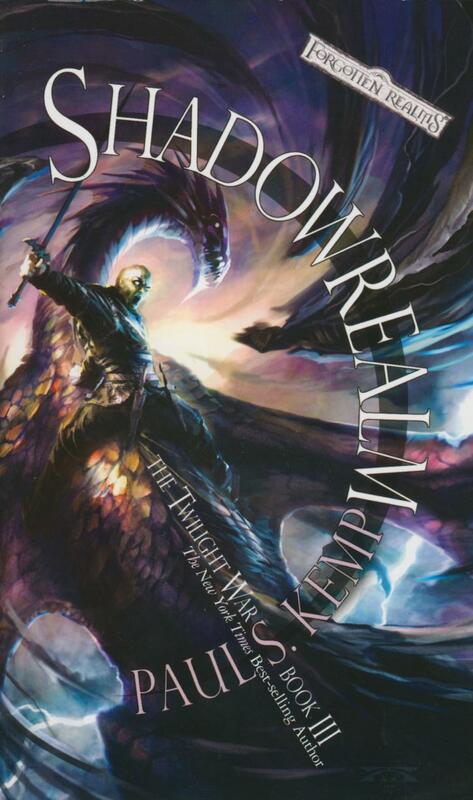 When Twilight War begins, we see how the goddess Shar, the Lady of Loss, is beginning to use her agents throughout Faerun to unleash the Shadowstorm. An event of biblical proportions, its only purpose is to reshape Faerun according to the whims of Shar, a world where death and misery rule supreme and are the two constants. Bit by bit, Paul teases out his characters as they set on the path to stopping Shar and her agents, specifically a human devotee who worships Shar at the cost of her humanity and the other being a Prince of the Shadovar, creatures of shadow and darkness much like Erevis has now become, but a fallen civilisation from ages past who still hunger for world ascendancy. The political intrigue in these novels is superb. Comparable easily to the detailed political machinations that I saw in C. L. Werner’s Black Plague #1: Dead Winter (review) last year, a novel that I regard as one of the best that Black Library has put out in the last five years, at the least. Initially, I disliked the heavy focus on all the politics, and the characters engaged in them. For one, it was all fairly predictable how events would fall out and second, I wasn’t interested in them in the first place. 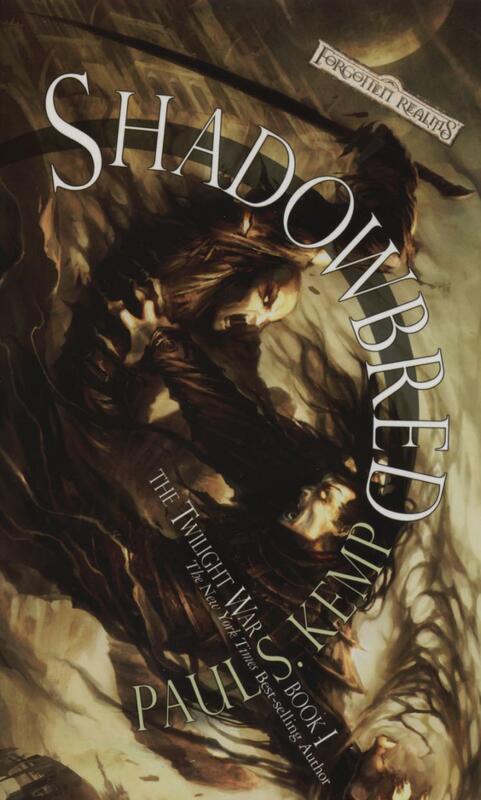 At least, until I finished Shadowbred I wasn’t interested. 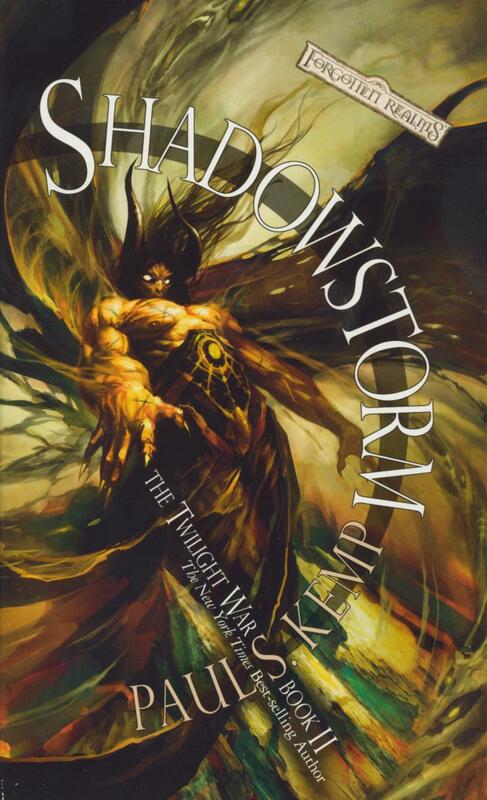 But by the time I was moving through Shadowstorm and later on into Shadowrealm, I was really enjoying all the political intrigue. I was now familiar with the characters, with the chess board of pieces that Shar had set in place and was playing off against each other. And I welcome all these political dealings. I enjoyed the slide into damnation that characters like Tamlin Uskevren and Mirabeta Selkirk were going through. It made for some really charged, excited reading. Of course, while I initially resented the focus on these “side-characters”, I was soon put at ease when Erevis and Drasek and Mags became prominent, as I wanted. Their bonds of friendship and trust drive much of the story. It is that very friendship that allows each of them to retain who and what they are, it allows them to stay sane in a world that is diving into insanity with every moment, even as revolution and war quickly become the norm. The characterisation of all three characters is top-notch, without a doubt. Even Drasek is much more of an appealing character this time around than he was in The Erevis Cale Trilogy. And Erevis himself, he was outstanding. He is one of my favourite characters in SFF ever, a character that I can readily sympathise with and a character that I enjoyed every moment of in all three novels. He makes for an excellent protagonist in every single way that matters. It is his devotion to his friends that defines Erevis, an element of his nature that he never loses sight, even when the entire world is against him, even when common sense tells him to break those bonds. And Mags, never have I felt sorrier for any character. Despite everything that happens with Erevis this time around, it is Mags who gets the shortest end of the stick again and again. In this, Paul shows that he is unafraid and even confident of putting his protagonists through the wringer again and again. Watching Mags suffer as he does throughout the trilogy was almost painful to read, because the poor guy just never manages to catch a break. But still, by the end, we see that he is a character to equal Erevis and Riven in becoming a favourite, and for all the right reasons too. In any epic fantasy novel(s), one thing I really enjoy reading about are the struggles between good and evil, struggles on the level of the gods and goddesses themselves. In Twilight War, these struggles are represented by the conflict between Shar and Mask and their devotees, the Sharrans and the Maskarrans. Characters such as Prince Rivalen and Elyria (Mirabeta’s niece and a primary antagonist) represent the former while Cale and Riven represent the latter. There are no typical struggles of good and evil here of course, since both Shar and Mask are divinities born and bred of shadows and darkness, and neither is good or evil in the typical sense. This is highlighted in Shadowrealm, if I remember correctly, when the characters learn one of the biggest secrets linking Mask and Shar together, a revelation that rocks not only Cale and Riven, but also Rivalen, and he is someone steeped in the lore of the Lady of Loss. This in turn retroactively highlight something else that Paul is really good at: twists and turns in the story that keep the reader guessing and throw him/her off. He presents a certain world-view for a good while, and then he sets up internal challenges to that status quo. This happens again and again, although with moderation of course. It is always refreshing and never gets old. I loved it whenever Paul threw up a spanner in the works. It allowed for some great drama and tension throughout the three novels. For novels that can be somewhat predictable, there are indeed elements of unpredictability throughout, and together, it all makes for a complete reading experience, one that I enjoyed without any reservations. The Twilight War is a trilogy that is steeped in the lore of the setting, and has some great characters along with a narrative that also has great pacing from start to finish. And the story isn’t always focused on the primary characters either, but takes the time, as I’ve said before, to focus on the “side” characters, those like not only Mirabeta and Tamlin but also those like Abelar Corrinthal, a servant of Lathander the Morninglord, and Malkur Forrin, a mercenary in Mirabeta’s pay and someone who is rotten to his core. As a final point, I just want to say that along with all the other strengths of the novel are two more things: the great action scenes that are involved and engaging, and also all the magical duels. Paul even brings the two of them together often enough and the results are just as great as I expected them to be. Twilight War is definitely a trilogy that I’d recommend reading. And if you do decide to read these novels, then you should make sure to read The Erevis Cale Trilogy, so that you have the background for these novels going in and so that you are not lost in any way. Posted on September 29, 2013, in Book Reviews, Review Central and tagged Book Reviews, Drasek Riven, Epic Fantasy, Erevis Cale, Fantasy, Forgotten Realms, Gods, magic, Paul S. Kemp, Review, Review Central, Twilight War, Wizards of the Coast. Bookmark the permalink. 6 Comments.